By D. H. Hill, Jr. 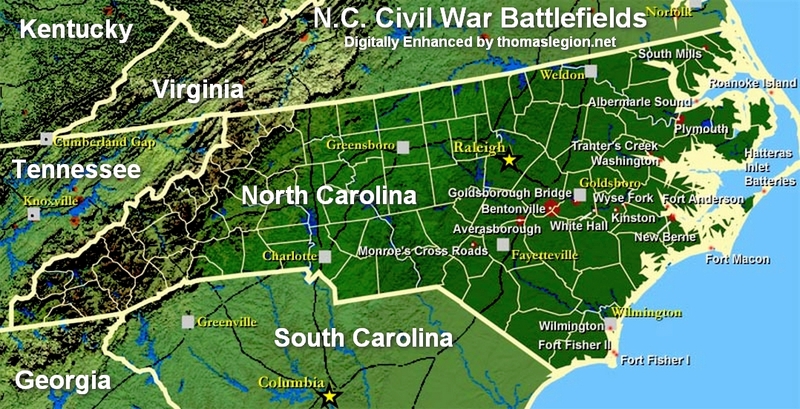 The Battle of South Mills was written by D. H. Hill, Jr., son of Confederate Lt. Gen. Daniel Harvey Hill, Sr., and is from his work, Confederate Military History Of North Carolina: North Carolina In The Civil War, 1861-1865. North Carolina native D. H. Hill, Sr., was one of only two lieutenant generals from the Tar Heel State and he was brother-in-law to "Stonewall" Jackson. 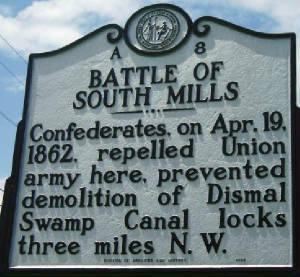 On the 19th of April a spirited action took place at South Mills, near the Dismal Swamp canal. 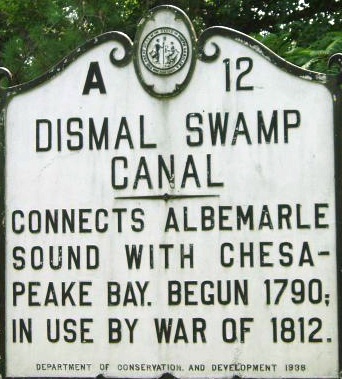 Rumors of [Confederate] ironclads building for a descent on the Albemarle fleet led the federals to send a considerable force, under General Reno, to destroy the locks that connected both the Dismal Swamp canal and the Currituck canal with the rivers . General Reno took with him from New Bern [North Carolina] the Twenty-first Massachusetts, "500 picked men," and the Fifty-first Pennsylvania. On his way, he way joined by Col. Rush Hawkins with his brigade, then stationed on Roanoke Island. Hawkins says that his force numbered 2,000 men. General Reno's whole command, including four pieces of artillery, numbered fully 3,000 men. This force was landed from transports at Elizabeth City, and at once marched toward the locks. Near South Mills it encountered Col. A. R. Wright, commanding the Third Georgia regiment (585 strong), some drafted North Carolina militia, Gillett's company of Southampton cavalry; and McComas' battery of four pieces. 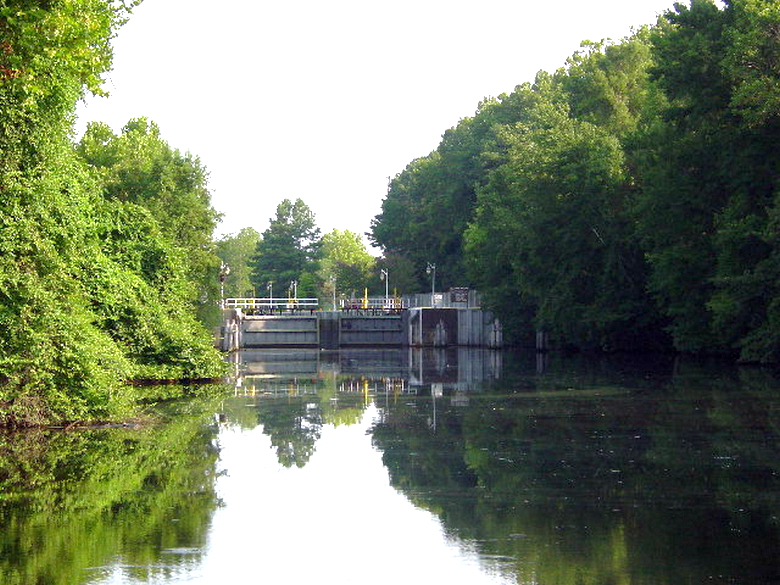 (Above) Great Dismal Swamp Canal Locks entrance to South Mills. Wright's total force seems to have numbered about 750 men. Of these, he sent three companies and the militia a mile to the rear to hold an important crossing. Stationing his artillery in the road and supporting it with his little force, which General Huger say was not over 400 men, Wright pluckily waited for the attack of the enemy. In spite of a long march, Reno, who had no idea of the small number of his foe, attacked promptly, but for three hours made no impression on Wright's force, sheltered cleverly by the artillery and a strip of woods. At last, McComas, who had fought his guns manfully, was killed, and Colonel Wright fell back a mile to his supports. General Reno did not attempt to follow, and that night at 10 o'clock left his dead and wounded behind and made a forced march to his boats. The losses of both sides were as follows: Confederate, killed, 6; wounded, 19. Federal, killed, 13; wounded, 92 . I have organized in conjunction with Commodore Rowan against that place (Elizabeth City), and if we succeed in capturing or driving the enemy back, we shall move up to South Mills and blow up the lock of the canal, and then proceed up to the head of Currituck canal and blow in its banks, thus rendering it impossible for the gunboats, which are said to be building at Norfolk, to come into these waters. Official Records, page 271, Series 1, Vol. IX. An interesting difference between official and private reports comes out in the Federal accounts of this battle. General Reno and his second in command, Colonel Hawkins, made such glowing reports of what they had done that their commander, General Burnside (Burnside's North Carolina Expedition), issued a congratulatory order to their troops. In it he felicitates them "upon the indomitable courage with which they attacked a large body of the enemy's best artillery, infantry and cavalry in their own chosen position, achieving a complete victory." Official Records, IX, 307. In a private letter to the same commander, the same General Hawkins says in reference to the same affair: "Doubtless the unfortunate occurrence of the 19th has been brought to your notice. No one can regret the result more than myself. First, because of the loss of life; second, the object of the expedition not being accomplished after all the obstacles in our way had been removed. It seems that both parties were badly frightened. The enemy ran like quarter-horses toward Norfolk, and we as fast as our weary legs would carry us toward Roanoke, leaving quite a number of wounded, and destroyed the bridges behind us." Ibid., 316. Source: Confederate Military History Of North Carolina: North Carolina In The Civil War, 1861-1865, pp. 32-33, 226-227.